Siding is the extra protective sheath that is commonly used not only to prevent moisture, dust and fluctuating temperature from damaging the structure of your house but also to enhance its aesthetic appeal. The siding that you use - be it vinyl, metal or wood is usually designed to bear different weather conditions and require minimum upkeep. Certain kinds of siding, however, do require extra care. That includes all kinds of wood sidings that are versatile, elegant and extremely beautiful. In order to avoid repairs worth thousands of dollars, it is essential that you have a schedule to inspect and maintain the shingles, clapboard and board-and-batten and at regular intervals, usually once in every four to six years, depending on the weather conditions. For Chicagoans, the schedule is closer to every two years. The wood sealers and stains that are used on your exterior wall often contain oil resins and alkyds. Over the years, algae and mildew start to gnaw on these natural oils, appearing as dark brown or black spotted stains. This has an adverse effect on the wood and may cause it to look dull and ageing. Cleaning them is easy, but be sure not to directly pour water on it with a pressure jet, as the moisture may seep into the crevices and wear away the wood. A much better way to clean off the mildew is by using a garden sprayer, mild oxygen bleach and a long brush. This not only gets rid of the micro-organisms but also retains the polish. The holes and cracks that develop in the siding over the years allow the growth of pests and termites. You should try to identify the correct nature of the problem before attempting to fix it, or the problem may reappear again. You might need to replace a few rotten portions, patch up a gap or nail a loose sheath. Most of these are easy to fix but how you actually it depends on the kind of siding you have. Of all wooden sidings, cedar is by far our favorite. A cedar shake is a wedge-shaped piece of wood that is installed vertically in long rows. Most of the time, the face of a shake is split, not sawed. Some manufacturers, however, offer both options, but the split face is considered more traditional. Splitting the shake also emphasizes the grooves in the wood, enhancing the appearance of the overall shingle. The face of a split shake, however, is much rougher than a sawed face shake. It has natural antibacterial and anti-fungal properties, allowing you to leave the wood untreated without worry of excess warping, rotting and cracking. It does weather, though, changing color throughout time, offering a much more rugged look than stained cedar siding offers. For those who like the stained look, cedar requires more maintenance than many other woods. To preserve the style as it is installed and first stained, you will need to re-stain or re-paint on a semi-annual basis. 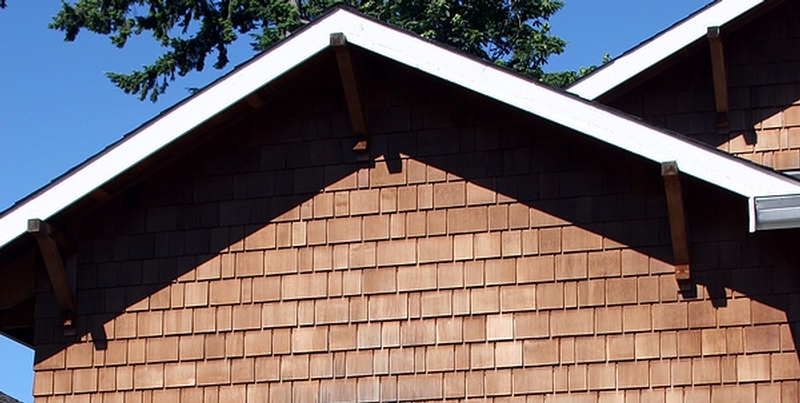 This is something to consider when choosing cedar shingles or siding. If your home has more than a single story, you need the help of some specialized equipment to repair and clean the siding, because the panels are extremely heavy. Do contact a siding contractor for this purpose to avoid the possibility of seriously injuring yourself in the process.